So this past weekend I decided to change up from normal kalk paste and swap in Hydrogen Peroxide for the RODI as I had some algae in an area I wanted to hit so thought maybe i could do both at same time. I have seen about 2-3 of my berghia since putting them in the tank so things are still cooking there to get the aiptasia I either dont see or can not easily get to. I need 2 new pumps for my back wall and am trying to use some of the credit I have with local shops to get em. Just waiting on what they have available or can order in for me. Likely going with Jabeo or Coral Box for the back again. New T5 bulbs ordered so awaiting them. I over extended my current bulbs and can tell with the colors dropping on some pieces. Still investigating the filter cups hitting market now and what material I would use in them. I dont run socks since they are a pain but the cups (while more expensive up front) seem to be better long term for those of us who are lazy and prefer to more easily swap things. I've heard good things about the coralbox pumps (though probably from you ). I might give the peroxide and paste together a try... Any recommendation the ratios? I have a few patches of bubble algae popping up (weirdly enough, only on frag plugs that came from other people's tanks...). I'm removing manually, but I'm still concerned. Wow it's been a while. I've bought my jetskis, spent numerous days at the beach house, and even had a 12 day European trip thrown in there as I hit Dublin, London, and Madrid. All the while my tank took a bit of a beating. Of particular note is fact that I dont see my mandarin and I have 1 anthias left. I worry tank was not fed enough and my brittle star has taken to fish. He is a big bigger and I might need to 0ull him. Not sure if he is green or not but also dont know what else would have taken some fish down. My aiptasia was under control then it wasnt and now I slammed the tank again this past weekend to knock then back. I will now be on weekly to twice weekly spot treatments. As summer comes to an end I will have more time for tank and as such will order in some more fish to fill me back out. Need to figure out what though. Wow you are still alive! it's like you went AWOL for the entire month, was begining to wonder what was up. Ha I'm always floating around. Though I must say I did enjoy the time from the tank. The itch is getting stronger to make some changes though so who knows what all fall will bring. Btw all those pics are from my phone and dont do justice. No filters or anything as I didn't break out the orange filters and dslr. Wow man, from the pictures the tank looks great. I'm glad you're out and about, and even though the tank suffered in some ways, it looks great and really filling in with great coloration. The growth really looks spectacular! I'm glad you're getting time away. I'm budgeting at work so it's busy season now. All summer I'm locked down, day in and day out rotating between family and work (mostly work). No rest for the weary and my tank looks like crap and I've lost many/most of my SPS frags. You around the 25th? We're planning to go to Sesame Place in your neck of the woods if the weather looks good, so might find some time to swing by if you're not too far out of the way. You mean Aug 25? Yes should be home that weekend. I sold 3 small frags for pennies on the dollar to a friend. In fragging them I knocked off a mini colony of my pink milli. I took the colony as my LFS guy had a stand at the show. I gave it to him to throw in his frag tank and see if it would sell for me. It sold in 10 minutes for $300 which was WAY more then I would have thought to ask for it. So now I will have a couple other items to come to the tank within the next week or so. First up is Pink Floyd frag which I will pick up next week. Also have a fish order about to come in which should refill my tank a bit. Good to hear things are going well for you! Been awhile since I've seen you on the forums... was wondering what happened to you. Actually jumping on plane tomorrow to san fran and then next week to Ohio and back to NYC. Have 2 trips to Texas coming up. Just a ton of travel but worth it. Tank is doing good but glass needs cleaned. I need to replace a few items too like my tunze ato pump, my calrx pump tubing, and some more items. Need new carbon and to refill my calrx media. I believe next month will be my first to set up a frag tank at a show. Going to have my own stuff and that of my local LFS to sell. That is one busy schedule for sure. Nice to have see are working out well for you! Good luck with the frag sales!!! Too bad your not going straight home from the Bay Area, you could've hit up Neptune Aquatics, Aquatic Collection and Diablo Corals. Not a bad haul for a single frag. You can now bank that and start investing in new fancy frags like Rakie has been... And then when those grow out and you sell frags, you can put that sold frag money towards all of that maintenance hardware you have to buy. Give me a shout next time you're in NYC. We can catch up for a beer in the city after your meeting, or grab dinner on your way to the airport (I live 10 minutes from LGA, assuming you're not driving to the city). Right now looking to make enough for some gear like alk monitor and frag swap set up. Sold couple more frags this week. Pics below. Going to go in with my lfs in October to set up a frag tank. Apparently things I thought were basic corals are flying out of his store and I have way more to cut. Hoping I can do decent at the swap to potentially convince wife on a grow out tank. Some more pics of items just for heck of it. Does the tenius have a larger colony in your tank, or just that frag? I can't really tell from the frag. 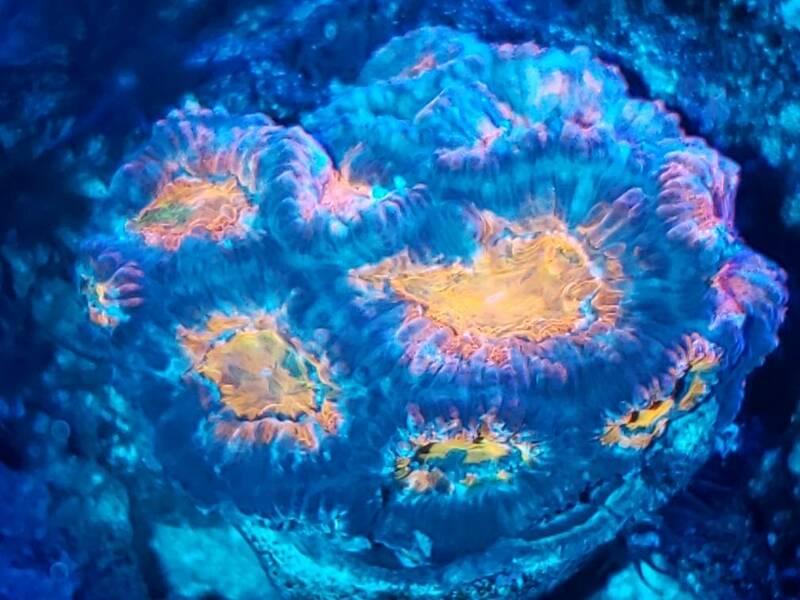 Those are all really some super looking corals though. You and Rakie have blown the SPS game straight out of the water. The tenius has a larger colony. I can easily make 5 if not 10 nice size frags for the upcoming swap. Have fish ordered. Hopefully they all make it through shipment and qt. have cut a ton of frags and more to be cut. This weekend is the first frag swap that I will be setting up a table for. Pretty excited about it. Now I just need to make enough to start to offset a frag tank setup and a frag swap setup. Already pinged multiple companies like Zen Reef and BAO for quotes. I will plumb in the frag display tank to my main tank and use their frag transport systems to take racks out and to the shows. I will need lighting yet and might GASP go LED so I can yank the light and take to the show when needed. Figure cheap jabeo pumps as well. I'm really happy for you! It's great to see someone venture into new territory like this. Best of luck!!! Sorry y’all been crazy busy and moved over the past month. Had to dismantle my BC32 for the move...gave away most of the system...my two black/white clowns are living in a 3 gal hotel on my counter. Funny that I start researching a new tank and I find this motley group who have already made the change! Can’t decide on what size reefer to get but I’m definitely going big this time. It was an ok weekend. I went to a local type of hobbyist show and as such people wanted cheaper frags. I was next to a vendor selling 10 to 20 dollar frags which hurt me a bit. Sure I had the color and such but it was what it was. All that said I sold half of what I took, made roughly 700 bucks, and have placed the order for BAO grow out and frag swap tanks. Should be here in December. My local LFS has about 500+ worth of my frags in the shop and I have roughly 500 in credit with him so I'll get my radion xr15 g4 pro there. Also going to snag the aquatic life hybrid fixture so I can have a mix of t5 and led on the grow out tank. When I go to a swap I'll just take the radion with me most likely. Undecided on that one though.